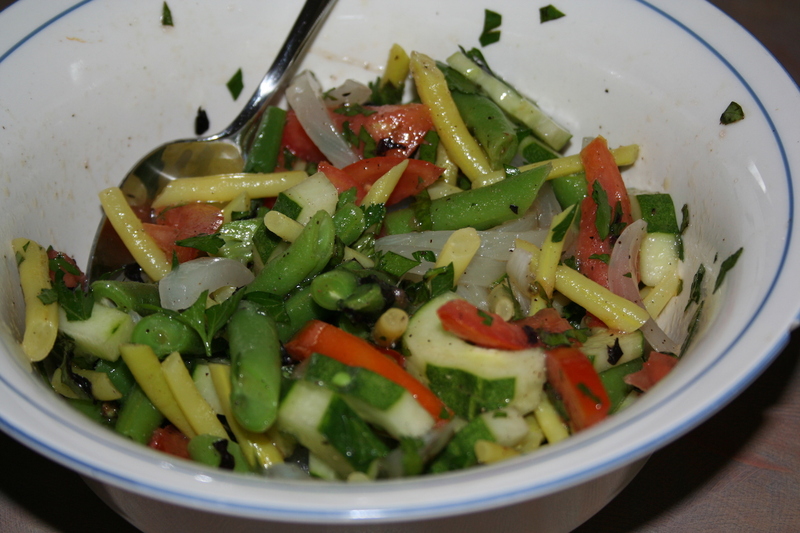 My vegetable garden is like a jungle these days, but it’s yielding some wonderful produce, including parts of this delicious two-bean salad I made recently. I had some leftover green beans and a tomato from the Northfield Farmers’ Market and a half a Vidalia onion from Just Food Co-op. From my garden, I picked a pile of the delicate yellow climbing bean (French Duet) I planted with seeds from Renee’s Garden, a cucumber, green and purple basil, and parsley. The recipe is simple. Cut the beans and onion into 2-inch lengths and start some water boiling. Since the green beans were a slightly tougher variety, I put them in first and cooked for 4 minutes; then I added the thin yellow beans for 2 minutes, and the onion for 30 seconds. (I am not a fan of raw onion, but those who are can skip that step.) Drain it all and run cool water over it to stop the cooking. Meanwhile, halve, seed and slice the cucumber, slice the tomato, and chop the herbs. Mix it all together with a generous shake of salt and pepper. For the dressing, I juiced a small lemon (again, from the co-op), added a tablespoon or so of red wine vinegar, and enough olive oil (maybe 1/3rd cup) to pull it together. Mix that up, douse the salad, and enjoy!